﻿ Best Price on The Lodge Bed & Breakfast in Kralendijk + Reviews! The Lodge Bed & Breakfast is 1312 feet from Kralendijk Beach and 5 minutes’ walk from Flamingo International Airport. 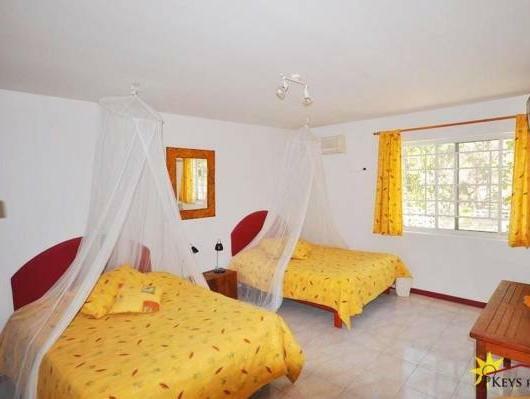 It features a central, furnished terrace and Wi-Fi in all rooms. The accommodations present basic décor with walls washed in white, air conditioning, a fan and cable TV. All rooms have a fridge and a private bathroom with a shower. The Lodge offers a breakfast with an extra charge and the Boehda Bar is open during the afternoon. The restaurants at Kralendijk Town are also an option 0.6 mi away. Activities like water sports, scuba diving and snorkeling can be arranged at this B&B. There is also a tour desk and the guests can rent a car and bikes. Wind and Kite serving beaches are approximately a 15-minute drive away and a supermarket can be found within a short walk. Please note that the City Tax (Government Fee) applies also to the extra person (older than 13 years).